The knife is one of the earliest tools used by men. It is present across all cultures, it can be a symbol of power and a true art object. Knifes have been used throughout mankind's history. Making knifes though is no longer a hand craft, as many other tools knifes have become an industrial product and only a few trades-people remain who are making unique, artful knifes by hand which in turn will cost quite a bit of money. 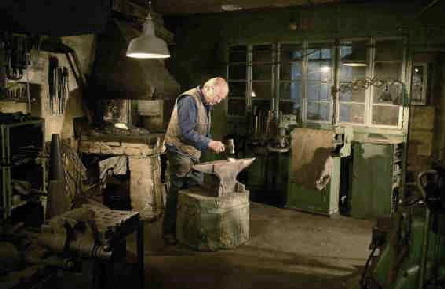 In Goerlitz on the river Neisse Franz Lattka, age 75, still knows the art of knife making. He practices the trade in the third generation. The work-shop as it was once set up by his grandfather has not changed much. It is located in the cellar underneath the the small store where the Lattkas sell their knifes now for almost one-hundred years. We observe while master knifesmith Lattka makes a pocketknife, exactly the same type he once build in his master exam. A switchblade with tree blades and a corkscrew..